As I have not blogged since October (gasp! Sorry mom!) and am due in 5 weeks, I figured I'd better get busy playing catch up. In true 'Tiahna' fashion, I am doing something I said I would never do again... be pregnant through the whole Summer. I am due on Lyla's birthday, September 5th. Ugh. Summer pregnancies are the worst. Granted, they are all I know. So maybe Winter pregnancies are the worst... God sure does have a sense a humor, anyway, of that I am sure. 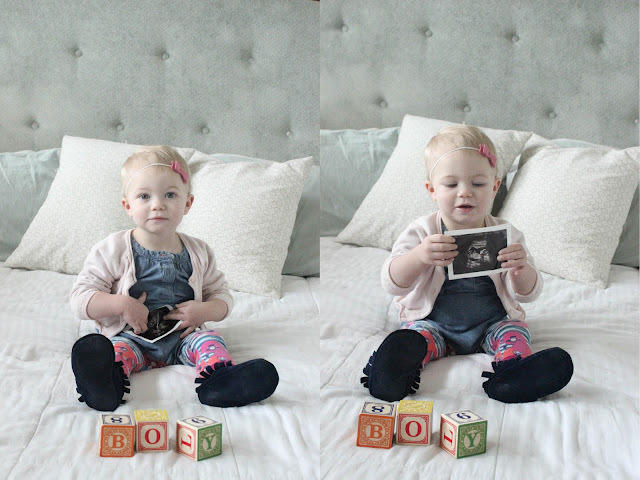 We found out we were pregnant on New Years Eve, and once we announced it to my family at the end of January, everyone was positive it was a boy. I felt confident of that, too. I had no idea what we were having with Lyla, but before we got pregnant with this one I knew there was a boy who wanted to come hang out with us. We found out the gender early, at 15 weeks, and I knew it was a boy before the ultrasound tech would tell me. Boy and girl ultrasounds sure look different! But the chord was between his legs so until she could prove it was a boy with 100% accuracy, she didn't say anything. But sure enough - BOY. At my 20 week ultrasound, the tech told me she thought my previous ultrasound was wrong! He was being insanely shy and wouldn't show us anything, not even good pictures of his heart. The doctor had to come in after a while and do some prodding to make the guy loosen up a bit. But once again, he finally cooperated for about 2 seconds and confirmed that he's a boy. This pregnancy has been so different than mine with Lyla. She never made me sick, I never had heartburn, I had lots of energy and felt great. This one hasn't been bad, but I did get sick in the beginning. Zofan worked a lot, but still the only foods that sounded one tiny bit appetizing were hamburgers (rare for me, I always prefer chicken) and mac n' cheese. Around 14 weeks I started feeling better, but I have insanely low blood pressure. All the time. I make the machines beep when my blood pressure is taken because its always so low. I see stars everywhere, even just sitting doing nothing. Its very odd. And then of course the never ever ending heart burn. But, guaranteed, it will all be worth it. I am getting so excited to meet the little guy and for Lyla to have a friend and buddy to love on! This sounds so similar to my boy pregnancies! Heartburn, crazy low blood pressure (to be honest, I'm hoping it stays low and I don't get preeclampsia again! ), gross nausea in the beginning... You are in the homestretch though and boys are SO fun!